Panels order EDP.com and LGI.com to be transferred back to their previous owners. Two three-letter domain names that were allegedly stolen from their owners have been returned through cybersquatting claims under UDRP. In this guest article, Michael Robini analyzes how many three letter .coms are used by end users. What percentage of LLL.com domains are really used by end users? And, finally, 43.2% of the whole LLL.com are developed and used by end users. Before publishing the current article, I wrote two similar ones related to LLL.in domains. The first one presenting our statistical method can be read here, and the second one validating the method can be read here. Some domainers found that our analysis was relevant, and asked us to do the same for LLL.com, focusing on domains developed by end-users. And this requirement included an improvement: splitting the analysis between Chinese premium domains (i.e. domains without the letters a, e, i, o, u and v) and Western premium domains (i.e. domains without letters j, k, q, u, v, w, x, y and z). We accepted with pleasure since the result could be interesting for the whole domaining community. This study mixes experimental analysis, statistics and computer science, and can be applied to any domain category: LLLL.com, a bunch of keywords domains, NNNN.com… We will try to detail as much as possible how to obtain the percentage of developed websites. Please also note that we are not the first to do this kind of analysis for LLL.com, Nat Cohen extracted this type of figures a few years back. First of all, the set of LLL.com domains on which we are working contains: 26x26x26 = 17,576 domains. Considering the letters included or excluded in each domains categories, the Chinese premium represent 20x20x20 = 8,000 domains, and the Western premium represent 17x17x17 = 4,913 domains. 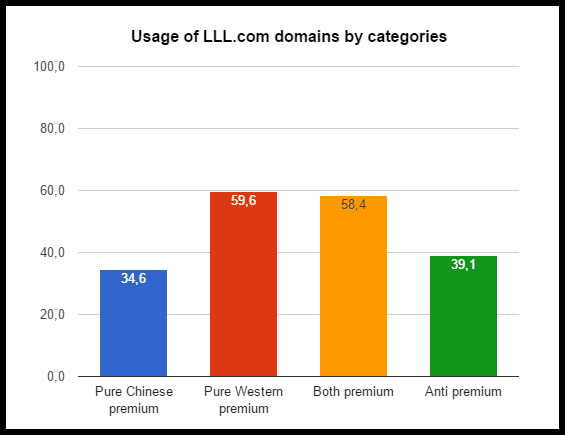 We would like to point out that an overlap exist between Chinese premium and Western premium domains: DRT.com belongs to both categories for instance. These domains will be named ‘both premium’ in the next parts of this article, and are built using the letters B, C, D, F, G, H, L, M, N, P, R, S, T. Consequently, they represent: 13x13x13 = 2,197 domains. With the introduction of this ‘both premium’ category, we indirectly created 2 new categories that we will name ‘pure Chinese premium’ and ‘pure Western premium’. They are, respectively, the Chinese premium minus the both premium and the Western premium minus the both premium. They represent respectively: 8,000 – 2,197 = 5,803 domains and 4,913 – 2,197 = 2,716 domains. We are left with a last category: the domains that belong to none of the 3 other categories, or, in other words, that are neither Chinese premium nor Western Premium. These domains mix the Chinese premium but non Western premium letters J, K, Q, W, X, Y, Z, with the Western premium but non Chinese premium letters A, E, I, O, but also any letters with one of the letters U, V, since U and V are neither Chinese premium nor Western premium letters. They represent respectively 3,108 (mix of J, K, Q, W, X, Y, Z and A, E, I, O) and 3,752 (domains including U or V), and will be called ‘anti premium’ in the rest of the article. We have thus a total of 3,108 + 3,752 = 6,860 anti premium domains. Clearly, all these numbers are too big to be analysed by looking at each domain one by one. But some clever ideas to do the job will be proposed in the next parts. We can start by removing parked domains (and domains owned by domainers) from the initial bunch of 17,576, since this will reduce the quantity of domains to analyse. To do this, the first step is to retrieve the nameservers of each domain. 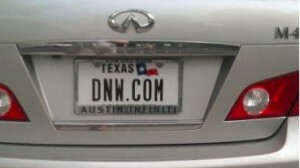 Using the nameservers, we will be able to identify all parked domains. Indeed, the nameservers of these domains will contain the name of well known parking companies like in NS1.SEDOPARKING.COM, NS1.PARKINGCREW.NET or NS1.BODIS.COM for instance. In order to list the nameservers of each LLL.com domain, we can either perform a ‘whois’ command of each of the 17,576 domain (longer, more complex, but most precise way), or scan directly the ‘Start Of Authority’ (SOA) field of the zone file by asking to a domain name server (the fastest, simpler, but somewhat sketchy way). More info on the zone file and SOA field here: Zone file. Using this table, we can sum the number of domains parked at the main parking companies, or that belong to domainers (lines with ‘Yes‘ in the last column of the table): 1,080 + 1,071 + 429 + 385 + 312 + 294 + 196 + 159 + 155 + 114 + 109 + 106 + 99 = 4,509. This means that at least 4,509 or 25.7% of LLL.com domains are parked or into the hands of domainers, the 13th May 2016. Others domains can be parked at smaller or unknown companies, can be not resolving, can be redirecting or can be developed websites. This last category includes domains under construction, domains with a unique simple or void page or real end user developed domains. And this is this last sub-category that will be of interest for us in the next parts. Naturally, the total number of domains from this 4 groups is: 4,416 + 2,243 + 1,819 + 4,589 = 13,067, that is the number of domains non-parked or not into domainers’ hands, established in part 4. Again, each of these sub-groups contains a number of domains too big to be analysed one by one: we can’t look at each domain to check if it is resolving, if it is parked, developed, etc… So, in this second step, we will use statistical samples to evaluate, with a given and known precision, the number of developed domains in each group. In other words, we will look manually at small groups of domains, and we will extrapolate the result to the whole groups. But the ‘small’ groups need to be ‘big enough’ to have relevant results. For more details, you can have a look at the following pages: Sample size determination and Sample size calculator. Again, looking one by one at all the domains contained in these 4 samples is not an easy task, even if they are smaller. We have to open an url and wait for the page loading for each domains… Instead of this, we created a small tool that takes screenshots of websites from a list a domains (using the Selenium tool and the PhantomJS webdriver. More info here). Like this, our final job is only to review 4 bunches of pics, to determine which domains are really developed in each of the 4 samples. A standard developed website, even a one page personal domain, whatever the quality of the website, is considered owned and used by an end user. A domain redirecting to a domain from the above category is considered owned and used by end user as well. A domain displaying a template page that can be found on other domains, is not considered in use by an end user. It is considered owned by investor. A domain showing ‘For sale’, or with only a contact form, is not considered owned by end user. A domain not resolving is not considered owned by end user. A parked domain is not considered owned by end user. For the first group of 4,416 pure Chinese premium domains that are not parked, we chosen randomly (using the Unix ‘shuf’ command) a sample of 860 of them and took the associated screenshots. From the pics analysis, we identified 391 developed domains corresponding to 45.5% of developed websites. This means that 2,009 domains over the initial group of 4,416 non-paked domains are developed. Thus, we can extrapolate that 2,009 domains in the full group of 5,803 pure Chinese premium domains are developed websites. That corresponds to 34.6%. Finally, we can give a few more details to interpret this last figure. 43.2% of domains developed by end users, does not mean that 100 – 43.2 = 56.8% of LLL.com domains are into the hands of domainers. In fact, some parked LLL.com are already into the hands of end users, but they are just not using them. And around 15% of all LLL.com are not resolving: for these domains, for can’t know if they belong to end users or domainers. We can only conclude that domainers own less than 56.8% and probably less than 50%, if we assume that non resolving LLL.com belong for half of them to domainers, and half of them to end users. We would like to say thank you to Nat Cohen for the exchange of ideas, for his advices and for re-reading the article. A big thanks to you Nat. Thank you to Andrew too, that accepted to publish this article on Domain Name Wire. And a few words for the end: we would like to add that we are not IT experts nor mathematicians. Feel free to report any error in the study. All pics, samples, and software parts are available on demand. Here’s why you shouldn’t have sellers remorse. With the rapid rise in values for three and four character domain names, I’ve read some commentary from people kicking themselves for selling domain names too soon. Call it seller’s remorse, and it’s a feeling I think we’ve all had. But comparing the price you sold a domain name for and how much you could get for it today is irrelevant. It’s hindsight. 1. Even if you held on to the domain name longer than you did, you probably would have sold it before now. I’m reminded of this when I look around Austin and see the rapid rise in real estate prices. NGO loses attempt to get valuable domain name. International Electrotechnical Commission, a non-governmental organization, has lost a UDRP it filed against the owner of IEC.com. Although the respondent is listed as IEC Communications Ltd., it appears it’s really a domain name investor. The respondent said it acquired the domain name because of the value of rare 2 and 3 letter domain names, not to target International Electrotechnical Commission. This is most likely the case, and the three person WIPO panel ruled that the domain name was thus not registered in bad faith. The panel declined to find reverse domain name hijacking, noting that it was fair for the complainant to “test” the issue of whether the domain was registered in bad faith. That’s an interesting rationale. The respondent was represented by ESQwire.com. Counsel for IEC asked that I update this story to reflect that its client met the first prong of UDRP, that the domain name is confusingly similar to a mark in which it has rights.